Scottish Indexes is a family run business based in central Scotland. Graham first set up Maxwell Ancestry in 1996, then in 2001 his wife Emma joined the team. As far back as 2001 Graham and Emma were indexing records so that you could trace your Scottish family tree from anywhere in the world. Moving with the times, Scottish Indexes was launched in 2014. 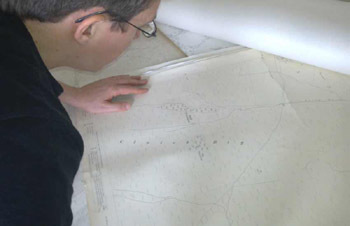 The new website gave online access to Scottish genealogy records. Throughout all this time, though, the goal has remained the same: to help others research their own family tree. Emma and Graham know how enjoyable it is to trace your family history. Most people want to experience that themselves, they want to be the detective in their own family history mystery. From time to time you need access to an original record here in Scotland or you need some experience, that’s where the professionals come in, not to take over but assist. Things have changed a good deal in genealogical research since the early days of the business. Back then, General Register Office staff would bring the original books to your desk, where you would wade through the volumes and take painstaking notes. As well as being time-consuming, this method meant that with time and use the books were wearing out. 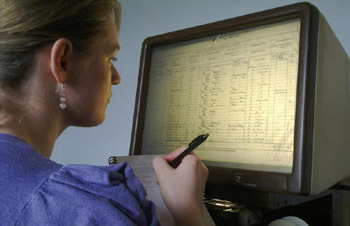 The General Record Office moved to copying all their documents onto microfiche: you got the correct reference from the computer index, filled out an orange slip and then sought the correct microfiche from the drawer. While this process safeguarded the books it was still very slow. Fortunately, these days the images can be viewed on the new computers - speeding up the whole process considerably, and giving us more time to add detail to family trees. As well as an index to 1000s of historical records Graham and Emma have created a Learning Zone where you can learn more genealogy skills. From a beginner’s guide to using High Court records you’ll find a wealth of knowledge. The Asylum section of Scottish Indexes will help you find out about every Scottish asylum, where the records are held and how to access them. At the heart of this though is a couple who want to help you trace your Scottish family tree. If you have any questions, contact them and ask! To keep up to-date you can follow Scottish Indexes on Facebook @scottish.indexes.